It's no secret that Vietnam is one of the ultimate foodie destinations. Vietnamese cuisine is delicious and full of regional quirks and twists which keep it delightful and surprising. The traveller can discover a new dish in every city. I suppose the most popular dishes, at least of Southern Vietnamese cuisine, include banh xeo, canh chua (sour soup), pho bo and bun bo hue. OK, I know it's not particularly exotic, but there is something so delicious in the simplicity of this popular Vietnamese breakfast dish. Two fried eggs, the yolks still runny, a sprig or two of parsely, two warm baguettes (banh mi) and lashings of "enhanced" soy sauce (nuoc tuong) and then go ahead and make an enormous mess with hands and fork. Vietnam's contribution to global obesity, Bo Ne is a popular street-side dish, and Bo Ne restaurants are normally filled with bodybuilders and chubby guys. 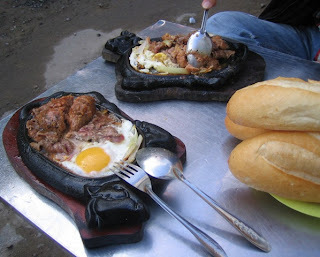 A small beefsteak, a meat ball, some fried pate and some french-fries all sizzling together in inch-thick grease on the same plate. You add the bread - preferably rolls and rolls of it. 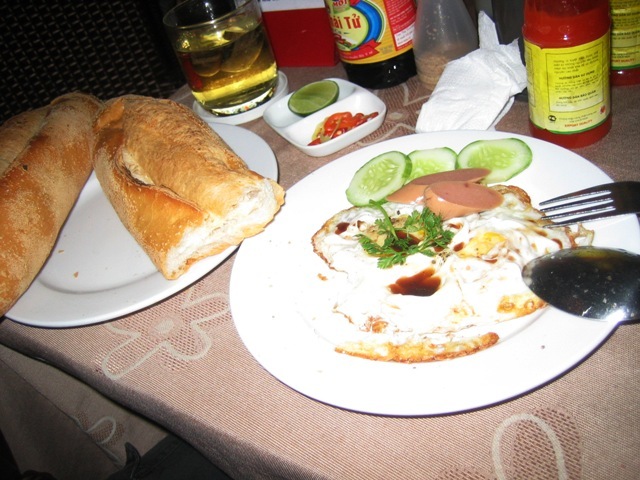 In Saigon this is the macho dish supreme. These days you can get Pho Ga in big Pho restaurants, but it's normally tasteless and dreadful. For the real thing you should find the streetside stalls that specialise in only that. Invariably run by women from the North, this street Pho Ga is tasty, delicately flavoured and much lighter and more subtle than its beef cousin. It is also served with a little dish of shredded lime leaves which, added to the soup, impart the most exquisite flavour. Hu Tieu is perhaps the most pan-Asian dish that can be imagined. Having its roots in China, it can be eaten in different forms in Vietnam, Cambodia, Thailand and Malaysia. 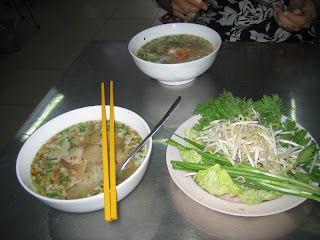 In Vietnam the favoured variety is Hu Tieu Nam Vang - Phnom Penh style Hu Tieu. The soup is sharp and flavoursome, but generally Hu Tieu Nam Vang is served with way too much offal meat for me. I ask for it greatly simplified - a slice or two of pork and some pork mince, and I add my own dandelion leaves, which come on a separate plate. Delicious. 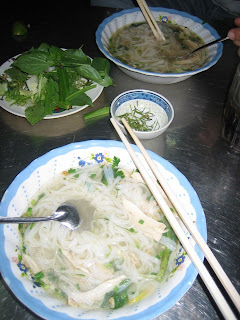 But a word of warning - one bowl of Hu Tieu is not enough for a meal. It should only ever be a snack. 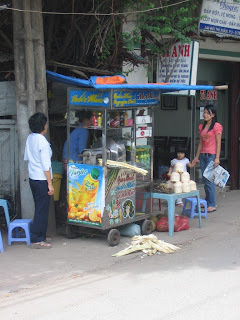 Little stalls selling sugar cane juice on the side of the road are a common sight in Vietnam, and I can never stop myself from pulling up and buying one. Nuoc Mia is perhaps the most efficient system for delivering pure sucrose into the bloodstream ever invented. The cane is pressed right in front of you and the juice (let's call it juice, but we all know it's pure sugar) is strained and poured over ice with a squeeze of lime. The reaction to this drink is almost purely chemical. And tantalisingly, there is never enough of it, so that it's all too easy to order one more glass. These longer and fatter cousins of the more usual Goi Cuon have been popular in Saigon now for some years, and I just adore them. 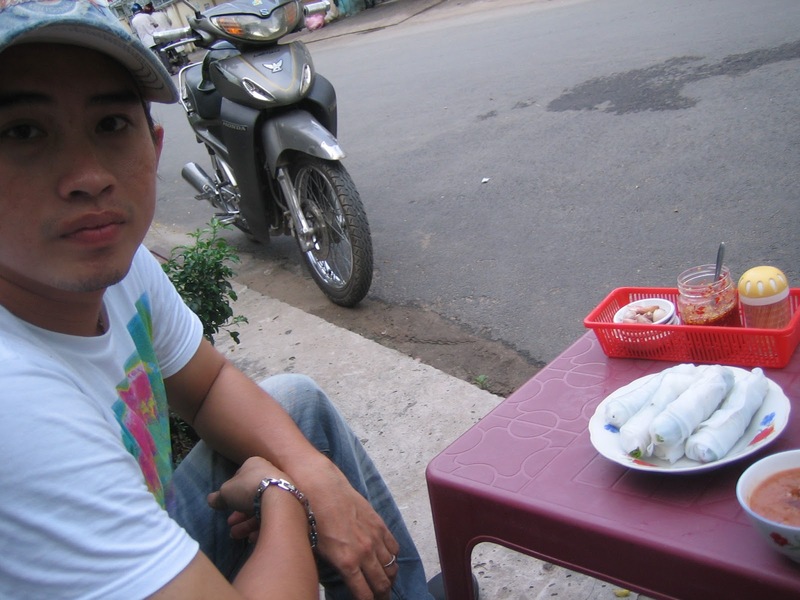 Instead of the more familiar thin and delicate rice paper used to wrap the Goi Cuon rolls, Nem Cuon employs a fat rice noodle, making each roll a longer and more substantial dish. The filling is also different - normally just lettuce and slices of barbecued Nem (cured pork). And finally, the dipping sauce is different - a thicker and more substantial nuoc cham containing grated ginger and chunks of garlic, more reminiscent of the sauce that accompanies Hai Nam Chicken. Unfortunately a restaurant specialising in this dish is just a few doors down from my house in Saigon, and it is easy to "treat myself" a few times a week to a few rolls of this surprisngly filling dish, as a special "snack."